With great pleasure, Atlassian presents Confluence 5.4. Over 13 feature and improvement requests fulfilled. More than 600 votes satisfied. We have streamlined working with JIRA Agile (formerly known as Greenhopper) and Confluence to help software teams through all phases of the agile development process - defining requirements, planning sprints, populating the backlog, reporting on progress and running retrospectives. Create issues and epics without leaving the editor. Highlight text to create stories in JIRA and automatically link them to an epic. Create a page from an epic - for example your requirements page for that theme of work. Create a page from a sprint - for example a your sprint meeting notes. Link epics, issues and sprints to existing Confluence pages - for example design docs, technical specifications, customer research. Create a retrospective page when completing a sprint. We think these improvements will make a huge difference for team leads and developers who spend much of their time in JIRA, and for product managers, project managers and business analysts who spend more of their time in Confluence. No matter where you are, related JIRA and Confluence content is only a click away. What versions of JIRA and JIRA Agile do I need? JIRA 6.1.3 or above to create JIRA issues from text in a Confluence page. JIRA 6.1.3 or above and JIRA Agile 6.3.5 or above to create pages, link to pages or view linked pages from JIRA Agile. If you use Confluence and JIRA together it is now even easier to create JIRA issues right from your Confluence page. 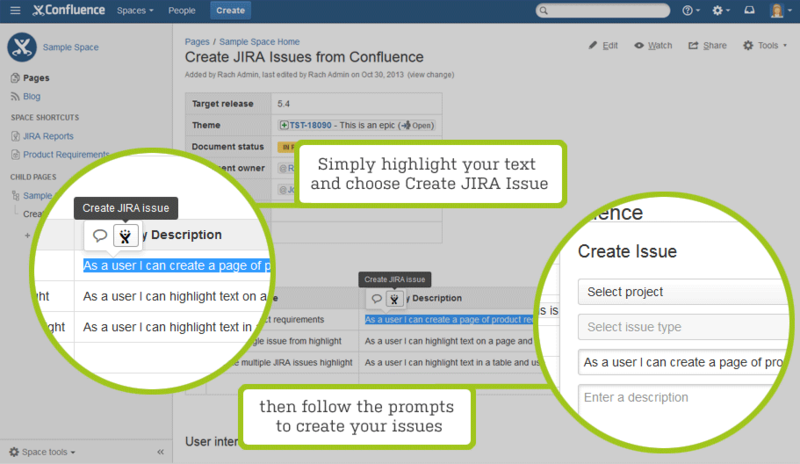 Highlight any text on a Confluence page and you will see a Create JIRA Issue option near your selection. What can you do with it? Create a single issue from the highlighted text. Create multiple issues from highlighted text in a table - an issue for each row in the table. Automatically embed the new issues on to the page so you can track their progress. Link the new issues to an epic, if your page already has epic embedded on it. This is a big timesaver for common tasks like transitioning your requirements into your team's backlog. For example, in the Product Requirements blueprint - you can add an epic, highlight some text in the Story column, choose Create JIRA Issue and follow the prompts to create all your stories in one easy step! You'll need JIRA 6.1.3 or above to use this feature. Reviewing a requirements document, meeting notes, decision or project plan? 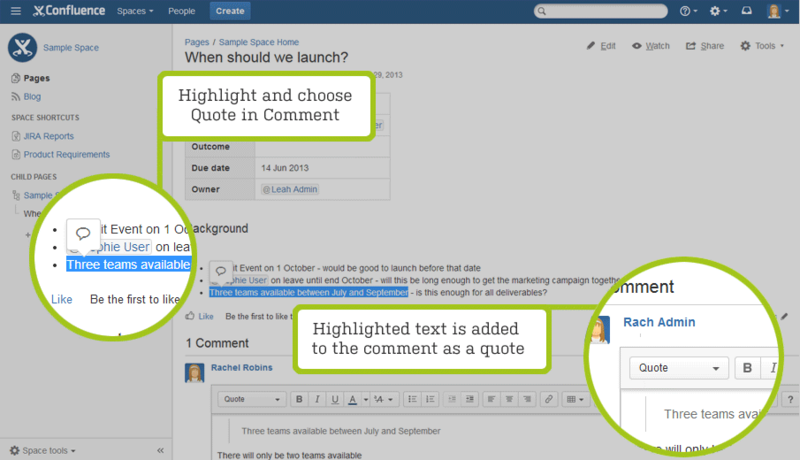 Highlight any text on a Confluence page and you'll see a Quote in Comment button near your selection. This will add your selected text to the comment field, with the quote style applied - much faster than copy and paste. If you use JIRA and Confluence, creating change logs and status reports is now simple with the new JIRA Report blueprint. Choose Create > JIRA Report and follow the prompts. The Status Report uses the new JIRA Chart macro, which enables you to display information from JIRA as a pie chart. The Change Log report displays a snapshot of your progress. As with most page blueprints, the templates can be edited so you can customize the reports for your team or project. Confluence now has a Retrospectives blueprint to help you take inventory of what went well and what didn't during a sprint or project. Choose Create > Retrospective. Use this page blueprint at the end of a sprint, release cycle or project, and collaborate with your team to document your strengths, address opportunity areas, and assign tasks for the future. 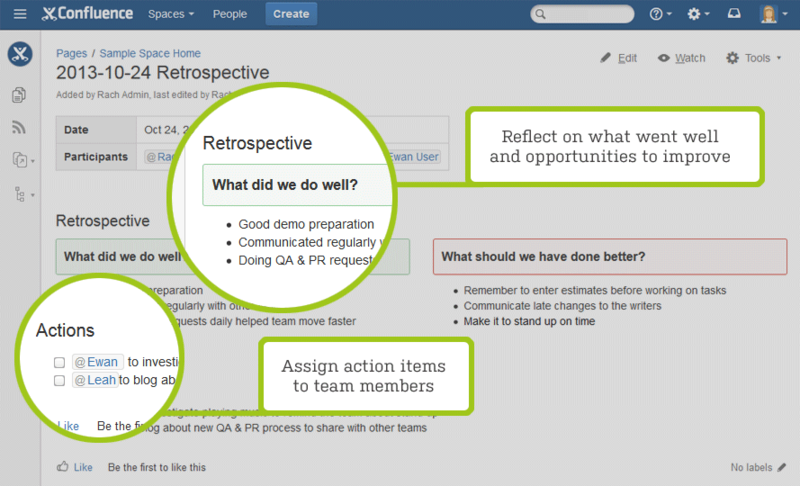 If you use JIRA Agile 6.3.5 or above, you'll be prompted to create a retrospective page right from your sprint! Get immediate context about how your content relates to your projects in JIRA. A new button appears at the top of your page when there are connections between the page and JIRA or JIRA Agile. Click the button to see details of issues, epics and sprints connected to the page - giving you great traceability right from within Confluence. in JIRA Agile by linking a page to a sprint or epic. We've also made some changes to the page byline to make it easier to see information about your page at a glance. Ready to share your software with your customers? 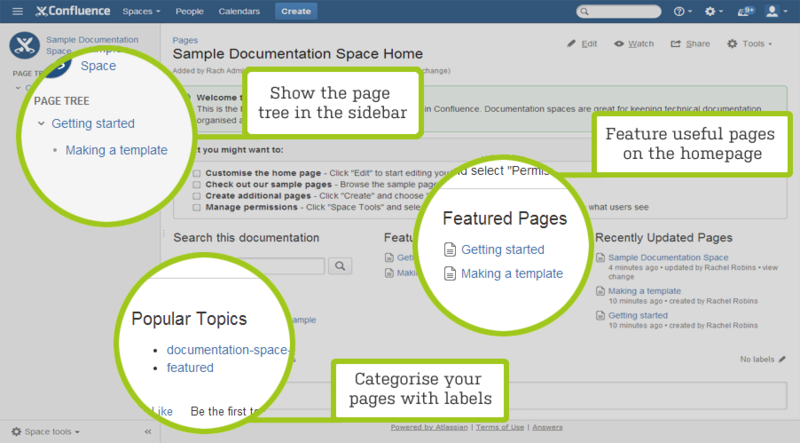 Manage your documentation in Confluence with the new Documentation space blueprint. Documentation spaces use the full page tree in the sidebar, a search field to search only in that space, and labels to add topics to your pages. The new JIRA Chart Macro enables you to display the results of a JIRA search as a pie chart on a Confluence page. 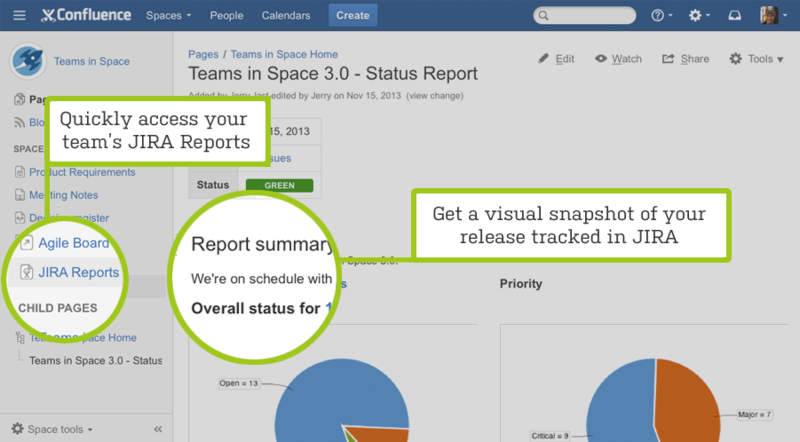 See it in action in the JIRA Report blueprint or add it to any page via the macro browser. use autocomplete to select which columns to include in the JIRA issues macro (table view). There's also a handy refresh icon, so you can refresh the macro when viewing a page to see recently added or updated issues. This macro has been updated to include pagination and sorting. You can specify the number of items to display on each page of the table (with links to additional pages of results) and also specify a column to sort the table by. We've improved the Product Requirements blueprint to make use of the new integration points between Confluence, JIRA and JIRA Agile. There's a new prompt to create a JIRA issue or epic to track your requirements and we've renamed some table headings to make the experience clearer when you highlight text to create your stories in JIRA. We've also introduced a new type of instructional text that can be used in any template that, when clicked, triggers the JIRA Issues macro dialog allowing users to search for or create an issue. Learn more about how you can using this feature in your own templates. conduct a retrospective after completing a sprint. Learn more about the JIRA Agile side of these new features here: JIRA Agile 6.3.5 Release Notes. New version of the Atlassian Plugins Framework, which includes an upgrade of Spring from version 2 to 3. Upgrade to Joda-Time version 2.3. PostgreSQL 9.1 and 9.2 are now officially supported. New plugin point: additional instructional text type that triggers the JIRA Issues macro dialog allowing users to search for or create an issue. New plugin point: page byline - the area where the new JIRA Links button is located is now pluggable. New plugin point: contextual highlight panel. For a full description of these changes and tutorials, please see our guide to Preparing for Confluence 5.4. ... and the many more of you that made suggestions and reported bugs on our issue tracker!